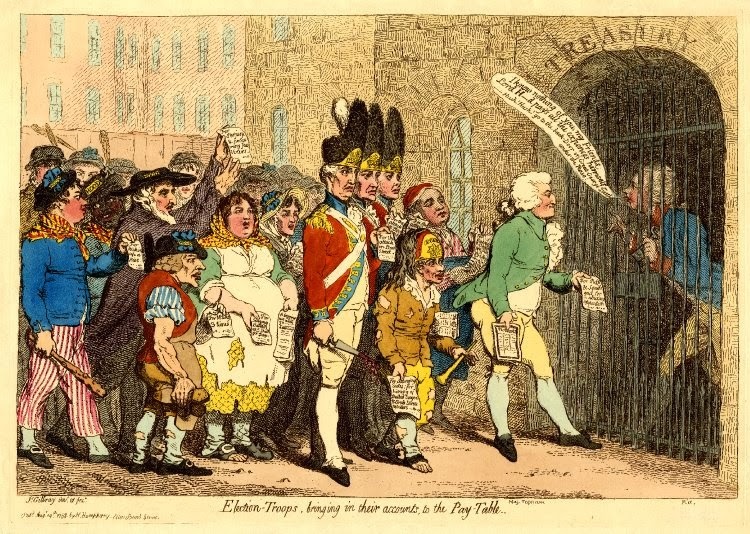 Election Troops, bringing in their accounts, to the Pay Table, James Gillray, 1788, British Museum. 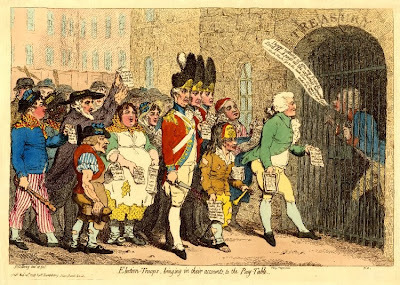 In his typical biting satire, Gillray shows Pitt directing all of his brigands to the "back" of the treasury to receive pay for election fraud and voter intimidation. Cudgels and bloody bayonets abound, along with tickets describing the tasks of each blackguard. At the far left is a sailor, who holds a paper inscribed with: "For kicking up a Riot." Beside him is another tar, this one wearing the same slop clothes as his mate. What makes him unusual is that he portrayed as a shockingly racist caricature of a black sailor. 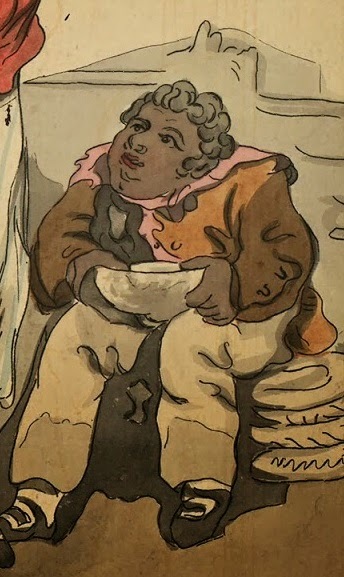 There are few images of black sailors in my period of study, but thus far they have been more realistic depictions of mariners of African descent, as in Rowlandson's The Jovial Crew. It is probably that Gillray is trying to emphasize the meanness of the crowd by making one of the sailors a version of "black" that can be dismissed as less human. He has portrayed the sort of figure that is more common in antebellum American minstrel shows than in depictions of sailors from the eighteenth century. The violent tar in the foreground wears a black round hat with a blue bow on the right side. His short jacket is double breasted with open slash cuffs and cloth covered buttons. There are no waist pockets. About his neck is a yellow neckcloth with red stripes, the same neckcloth that his mate wears. His trousers are white with narrow vertical red stripes that end above the bottom of his calf. His stockings are white and his shoes are pointed toe with white metal rectangular buckles. Both sailors hats bear a badge reading "Hood." These are election badges worn by all of the paid supporters in this piece, and do not represent a ship's name or specific naval affiliation, unlike the badges worn by the crew of the Edgar in William Henry Bunbury's From a Sketch taken at Portsmouth. The Edgar's men are still the only sailors I am aware of in my period of study that wore the name of their ship on their hats.